BRUSSELS — European Union lawmakers voted on Wednesday to launch action against the Hungarian government of Prime Minister Viktor Orban for allegedly undermining the bloc’s democratic values and rule of law. Hungary called the vote fraudulent and vowed to challenge it. The lawmakers voted 448-197 in favor of a report recommending the launch of a so-called Article 7 procedure, which could lead to the suspension of Hungary’s European Union voting rights. Critics say that Hungary’s electoral system is disproportionate, media freedoms and judicial independence are dwindling and asylum-seekers and refugees are mistreated. It is the first time in EU history that the European Parliament had initiated and approved such a motion, which needed a two-thirds majority to pass and was approved by 69.4 percent of the lawmakers. For years, Orban had been able to deflect much of the international condemnation thrown his way. Critics say that Hungary’s electoral system is disproportionate; media freedoms and judicial independence are dwindling; asylum-seekers and refugees are mistreated and there are limits placed on non-governmental organizations. Hungarian Foreign Minister Peter Szijjarto, echoing Orban’s longtime position, called the Wednesday’s vote “petty revenge” against Hungary for its tough anti-migration policies. “This decision condemning Hungary and the Hungarian people was made because we Hungarians have demonstrated that migration in not a necessary process and that migration can be stopped,” Szijjarto told reporters in Budapest. He also claimed that the vote involved “massive fraud” since abstentions weren’t counted into the final tally, which made it easier to reach the needed majority. There were 48 abstentions, so the 448 in favor exceeded the two-thirds needed only because it was based on 645 votes. If the abstentions were counted into the final tally, there would have been a total 693 votes, so the 448 in favor wouldn’t have reached two-thirds. Szijjarto said Hungary was considering legal options to appeal the result because of the way the vote was tallied. But Judith Sargentini, who presented the report prepared by the European Parliament’s Committee on Civil Liberties, Justice and Home Affairs, welcomed the outcome. “This is a historic result for Hungarian citizens and for European citizens everywhere, that the European Parliament has voted by a large majority to stand up for the values we all hold dear,” Sargentini said. Several non-governmental organizations targeted by the Orban government with restrictive rules — including a special tax on activities considered as promoting immigration and the criminalization of the aiding of asylum-seekers and refugees — also hailed the vote’s outcome. Grabbe’s organization is part of the Open Society Foundations set up by Hungarian-American billionaire and philanthropist George Soros, an ideological opponent of Orban and blamed by the Hungarian leader, along with the NGOs Soros supports, for promoting mass immigration into Europe. Soros has repeatedly denied the allegations. The move saw some members of the European People’s Party bloc — of which Orban’s Fidesz movement is a member — vote against their ally in Budapest. Even EPP leader Mandred Weber, who earlier was supportive of Orban and is seeking to become the European Commission president next year, said he had voted for triggering Article 7. “I have always been in favor of building bridges and I want to continue to do so, but yesterday (Tuesday) I didn’t see any readiness from the Hungarian PM to make a move towards his EU partners and address our concerns,” Manfred tweeted. While Weber had called on Orban to show a willingness to compromise on some of the most high-profile issues — like an agreement being delayed by the Hungarian government for the Central European University, founded by Soros, to remain in Budapest and recent laws criminalizing the work of civic groups working with asylum-seekers and refugees — Orban remained steadfast that his policies wouldn’t change. 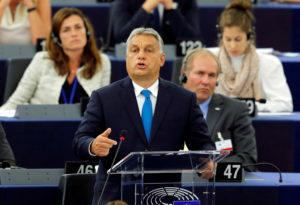 Orban, who was re-elected in April to his third consecutive term in office, fourth overall also said Tuesday that he expected lawmakers to approve the motion with the support of some EPP lawmakers. “The order has arrived from Berlin and they will vote accordingly,” Orban said, in reference to German Chancellor Angela Merkel, whose governing Christian Democratic Union is the largest party in the EPP. Orban has insisted that all of the criticism against his government is based on Hungary’s tough anti-immigration policies, which include fences built in 2015 on Hungary’s southern borders with Serbian and Croatia to divert the flow of migrants and very restrictive asylum rules.